If you are after a workout which is less than an hour but packs a punch, then F45 Fitness Training is something you should definitely take a look into. The whole premise of this form of training is to ensure that you get a top quality workout covered in just 45 minutes. There are over 27 different types of routines which you can choose from when practising this activity which means that you can switch it up effortlessly. Each session combines HIIT, circuit training and cardio into a cohesive and heart pumping routine. Some classes involve the use of apparatus, although it is possible to follow a routine along without the addition of these. And with the added bonus of a variety of regimes, you will never get bored of the same routine. 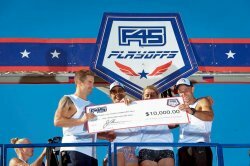 Every dedicated F45 trainer knows how significant the Playoffs are to their regime. This is a very popular challenge and has competition qualities. In order to prepare for this challenge, you would have needed to master all of the aspects catered for in the F45 training courses. The Playoffs is a state of the art fitness test aiming to push athletes to their limit to reach the winning podium. Within this tournament there are 10 fitness stations like in a circuit, but they all need to be completed within the allocated 10 minute time limit. And whoever is able to complete the challenge the fastest and most efficiently, stands a chance of winning thousands. Most athletes who take part in F45 routines strive to reach this stage of being prepared enough for the ultimate challenge. So, if you are up for a high intensity course which will test your technique, physical and mental ability and much more, then you can start on your journey to greatness now. Although this challenge is very popular in the F45 community, it is not essential for you to take part. This is purely an optional competition, so you can continue to train regularly attending your F45 training sessions happily without the added pressure of an impending tournament. Who is it Beneficial For? As F45 fitness training contains high intensity training along with cardio elements, it is definitely a demanding routine. Therefore, if you are currently suffering from any cardiovascular illnesses or recovering from injury, it may not be recommended that you give this type of workout a go. However, we do strongly suggest that you consult a doctor before making any decisions to train at an intense pace. If this type of training greatly appeals to you, then I bet you are wondering how you can get a piece of the action. You can have a look at your local leisure centre or speak to a trainer there to see if there are any classes with this technique included. Or alternatively you can head over to the F45 fitness training website and have a look at their locator to see if there is a class near you. When it comes to attending the session, it is best to always check with the trainer to see if there are any specific equipment items you need to bring with you. Most places would provide these for you, so you would only need to dress in appropriate gym wear and take a bottle of water to ensure that you are kept fully hydrated throughout the training session. Have You Ever Tried this Form of Training? 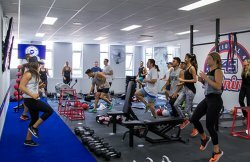 Throughout this article we have taken a look into F45 Fitness Training and how it is an effective way to keep fit. We have also explored the positive health benefits to the training and who it would be best suited for. However, now we want to know your opinion. Have you ever tried this form of workout, and if so, what was your experience like? Get in touch with us on our social media pages and let us know! You can also revamp your workout wardrobe ready for your next training session by shopping our array of fitness clothing over at Sports Fitness. Available in a range of sizes and designs, you are guaranteed to find your next training outfit all under one roof!